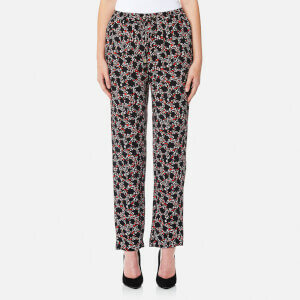 Women’s ‘Rosemont’ navy crepe trousers with an all over white dot print from Scandinavian brand, Ganni. Crafted from a lightweight crepe fabric, the trousers are cut with slightly tapered legs and zipper detail on the cuffs. Complete with a comfortable elasticated waistband. Model is 175cm/5'9" and wears a size EU 36.